Tofu shirataki noodles are a type of low-calorie, low-carbohydrate, low-fat Japanese noodle that are made from a combination of tofu and yam flour. It's important to distinguish them from regular shirataki noodles, which are not made with tofu and which have a gelatinous texture. Most tofu shirataki noodles and regular shirataki noodles are vegan. Tofu shirataki noodles can be used in place of regular pasta in nearly any noodle recipe, and they are a particularly good option for people who are trying to lose weight or limit calories. 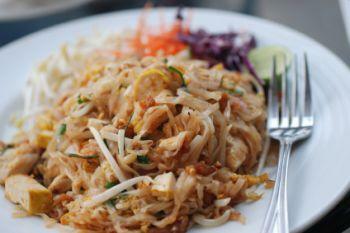 The most common brand of tofu shirataki noodles available in the U.S. is House Foods. These noodles are vegan, dairy-free, and gluten-free, making them a good option for vegans, vegetarians, and those with celiac disease or other dietary concerns. House Foods sells its shirataki noodles in three varieties: spaghetti, fettucine, and angel hair. Each package retails for between $1 and $2. The noodle packages need to be refrigerated after purchase and can be stored in the refrigerator for about a month with no adverse effects. One of the downsides of tofu shirataki noodles is that there aren't as many noodle shapes and varieties available as you can find with traditional pasta in a supermarket. It can be difficult to make a pasta salad or soup using these noodles because as of yet, they don't come in shapes such as bow ties, rotini, or elbows. The House Foods packages of noodles come pre-cooked and ready to eat. They are packed with a liquid that has a distinctive flavor, and most people prefer to rinse the noodles before they serve them to get rid of the packaged flavor. Another option is to briefly boil the shirataki noodles before serving. Boiling the noodles will also rid them of the packaged flavor and heat them up sufficiently. If you don't boil your noodles, you can heat them in the microwave or stir-fry them. Tofu shirataki noodles tend to be slightly chewy and slimy. To reduce the sliminess, pan-fry the noodles or dry them thoroughly with paper towels before serving them. On their own, the noodles do not have a strong taste, so it's best to pair them with foods that will lend significant flavor, such as rich sauces, broths, or condiments such as soy sauce. 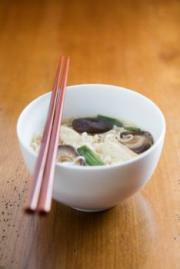 Prepare vegetarian pho using tofu shirataki noodles in place of traditional rice noodles. Spaghetti or angel hair varieties mimic the shape and texture of the rice noodles and will soak up flavor from the broth of the soup. Use the noodles in a dessert, such as Indian vermicelli pudding. To keep the noodles from developing a slimy texture, dry them thoroughly before adding them to the pudding, and chill the pudding well. Serve the noodles in a pasta dish in which they take a backseat to other ingredients. For example, in a stir fry with fragrant seasoning and lots of vegetables, add a few tofu shirataki noodles to diversify the texture. You can also try serving the noodles with homemade marinara sauce, which will disguise their blandness. Add chopped, rinsed, and dried noodles to salads or pre-made soups to enhance texture. So whether you're looking for a gluten-free or vegan product, these noodles are a fun alternative to rice-based and other pastas.